I'm an expert on recorded rain. 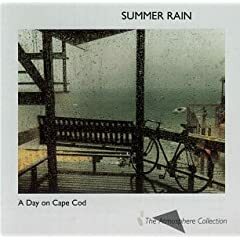 In an effort to relax myself into a sweet slumber, some years ago I purchased a CD called A Day On Cape Cod: Summer Rain. I've been to Cape Cod, and this CD was authentic — the rain was indeed overpriced and didn't dare moisten a Kennedy. But A Day On Cape Cod: Summer Rain also had a bunch of crickets. Not too loud, but they were there in the background. I couldn't relax listening to that CD — it brought back memories of bad stand-up performances. Thus began a year-long odyssey to buy and listen to every rain CD ever made. Most of them were awful. Some didn't mention that the rain was merely background accompaniment to some horrible New Age music. One I fell asleep to until the rain turned into a violent thunderstorm. The first thunderclap was like a gunshot. Before I got my bearings, I was convinced the riots had finally made it to Santa Monica. I listened to some ocean surf CDs as well (I enjoyed the irony of playing an ocean sounds CD in an apartment mere blocks from the actual ocean). Those CDs had their own problems — foghorns, the clanging of buoy bells and what sounded like rabid, angry seagulls. I settled on two tracks, both with extremely unsettling names. There are people who are lulled into dreamland by the sound of a vacuum cleaner? What exactly is an "Unscented Deodorant"?